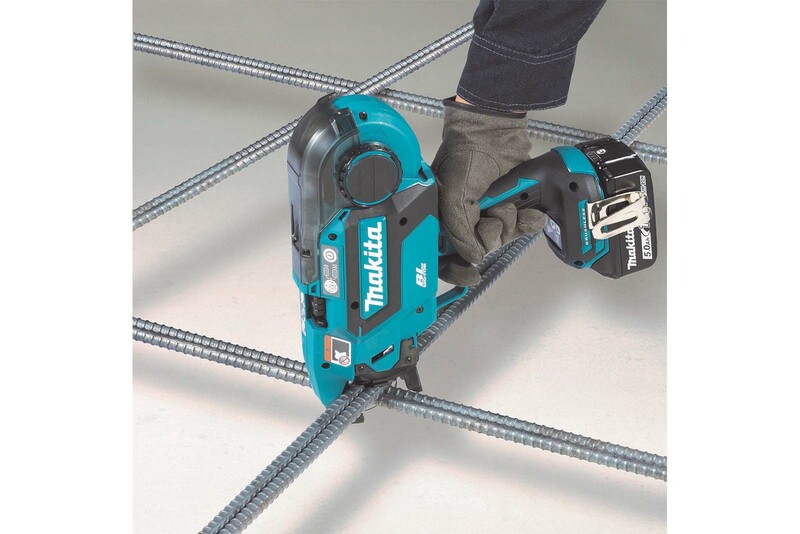 Makita’s first ever introduction of a cordless rebar tying tool is now available allowing fast and efficient application of rebar tie wire and eliminates manual action. The new DTR180ZK Rebar Tying tool is powered by a Brushless motor, for extended runtime and increased power, and is compatible with both 14.4V and 18V Makita Lithium-Ion batteries. Weighing a comfortable 2.6kg, with the battery, the DTR180ZK is designed to achieve the fastest method of applying rebar ties quickly and consistently and automatically delivers double loop ties for a range of construction applications such as building concrete foundations. It can be operated by a single hand operation, in single or continuous action, allowing the other hand to remain free to adjust the position of the rebars. This tool can be used with D10, D13 and D16 rebar in varying combinations of 2, 3 and 4 pieces of rebars. With a maximum power output of 340w, this tying tool can be used in continuous action mode for the most efficient tying. The applicator can tie rebars simply by pushing the contact arm against the rebars when the trigger is continuously pulled. According to the condition of tying material, the tying strength can be adjusted in six stages. Using a 5.0Ah Li-Ion battery, up to 120 ties of 0.8mm diameter annealed wire can be delivered.